1) What is IEEE Test Documentation Standard? IEEE Test Documentation Standard provides Test Documentation templates for Software Testing from Test Planning to Test Closure. 2) What are the Standards for software testing documentation? 1. IEEE 829-1998 Standard for Software Test Documentation. specifies the form of a set of documents for use in eight defined stages of software testing, each stage potentially producing its own separate type of document. The document can also provide a baseline for the evaluation of current test documentation practices. 2. IEEE 730, Standard for software quality assurance plans. 3. IEEE 1016-1998, Recommended Practice for Software Design Descriptions. 4. IEEE 1028-1997, Standard for Software Reviews. 5. IEEE 1063-2001, Standard for Software User Documentation. 3) What are the Standards for software testing terminology? 2. IEEE 610.12-1990, Standard Glossary of Software Engineering Terminology. 3. IEEE 729, Glossary of Software Engineering Terminology. 4. ISO/IEC 2382-1:1993. Data processing – Vocabulary – Part 1: Fundamental terms. 5. ISO 9000:2005. Quality Management Systems – Fundamentals and Vocabulary. 4) What r the Standards for software testing methodology? 1. ANSI/IEEE 1008-1987 IEEE Standard for Software Unit Testing -Description. 2. IEEE 1012-2004, Standard for System and Software Verification and Validation. 3. IEEE 1028, a standard for software inspections. 4. IEEE 1044, a standard for the classification of software anomalies. 5. IEEE 1044-1, a guide to the classification of software anomalies. 6. IEEE 1061, Standard for software quality metrics and methodology. 7. IEEE 1074-2006, Standard for Developing a Software Project Life Cycle Process. 8. IEEE 1219:1998, Software Maintenance. 9. BSC 7925-2 , Standard for software component testing. 10. ISO/IEC 9126-1:2001. Software Engineering – Software Product Quality – Part 1: Quality characteristics and sub-characteristics. 11. ISO/IEC 12207:1995. Information Technology – Software Life Cycle Processes. 12. ISO/IEC 14598-1:1999. Information Technology – Software Product Evaluation – Part 1: General Overview. 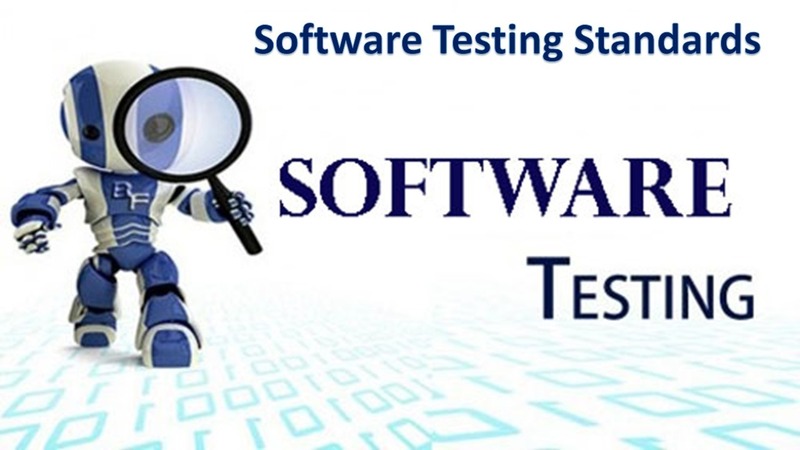 5) Can you list all IEEE Standards related with Software Testing ? IEEE Standards: Institute of Electrical and electronics Engineers (Founded in 1884) have an entire set of standards devoted to software. Testers should be familiar with all the standards mentioned in IEEE. • 610.12-1990 IEEE Standard Glossary of Software Engineering Terminology. • 730-1998 IEEE Standard for Software Quality Assurance plans. • 828-1998 IEEE Standard for Software Configuration Management. • 829-1998 IEEE Standard for Software Test Documentation. • 830-1998 IEEE Recommended Practice for Software Requirement Specifications. • 1008-1987(R1993) IEEE Standard for Software Unit Testing. • 1012-1998 IEEE Standard for Software Verification and validation. • 1012a-1998 IEEE Standard for Software Verification and validation –Supplement to 1012-1998 Content. • 1016-1998- IEEE Recommended Practice for Software Design description. • 1028-1997 IEEE Standard for Software Reviews. • 1044-1993 IEEE Standard Classification for Software Anomalies. • 1045-1992 IEEE Standard for Software Productivity metrics. • 1058-1998 IEEE Standard for Software Project Management Plans. • 1058.1-1987 IEEE Standard for Software Management. • 1061-1998.1 IEEE Standard for Software Quality Metrics Methodology. 6) How many categories of standards are there in software testing? Testing Standards broadly categorized into two types: External standards and internal standards. 7) What ISO/IEC 9126 standard deals with? What are the quality attributes for any software? 8) Can u tell me about ISO/IEC 9241-11? Part 11 of this standard deals with the extent to which a product can be used by specified users to achieve specified goals with Effectiveness, Efficiency and Satisfaction in a specified context of use. Standards are set of mandatory requirements established by consensus and maintained by a recognized body to prescribe a disciplined uniform approach or specify a product, that is, mandatory conventions and practices. Standards provide a body of knowledge that provides the basis for a professional discipline. 10) What is the basis for standards? 1. Communication – common terminology. 4. Benchmark of good industry practice. 11) Explain about ISO/IEC 29119? The proposal of 29119 ISO project was in February 2007. 1. This project will produce a software testing standard applicable to all types of software products and software-intensive systems. 2. Purpose: unify and integrate the currently fragmented corpus of normative literature regarding testing that is currently offered by three distinct standards-makers: BSI, IEEE, and ISO/IEC JTC 1/SC 7. 12) What are the ISO Committees and Working Groups? 1. ISO: International Organization for Standardization. 3. SC7: Software & Systems Engineering. 13) What the International standard ISO/IEC 29119 provides? International standard ISO/IEC 29119 will provide practitioners with guidelines for testing that cover all aspects of the life cycle. 1. Provide consistent set of definitions, processes, procedures & techniques for software testing. 2. Fill gaps not covered by current standards. 3. To be adopted by national standards bodies. 4. Currently has representation from 18 nations and is being reviewed by software testing professionals world-wide. 14) What are the Concepts and Vocabulary ISO/IEC 29119 Software Testing? 15) What is IEEE 1061 standard? IEEE 1061: A methodology for establishing quality requirements, identifying, implementing, analyzing, and validating the process and product of software quality metrics is defined. 16) What is IEEE 1059 standard meant for? IEEE 1059 : Guide for Software Verification and Validation Plans. ISO means International Organization for Standardization (ISO). ISO is a worldwide federation of national standards bodies that creates standards and enforces their application. Over 13,000 standards exist, covering most industries. 18) What is CMM/CMMI and how it is related to Software Testing? CMM was scarped, now CMMI only applicable. 20) What Is Six Sigma?